In tonight's ep, Aarón Sánchez and Chris Cosentino battle Claire Robinson of 5 Ingredient Fix and Food 2’s Kelsey Nixon of Kelsey & Spike Cook. They'll be hitting up Dylan’s Candy Bar, Russ & Daughters, and The Brick Lane Curry House to "devour the hottest dish in the world." Taping the show was the best of times and the worst of times. Don't get me wrong...I had an absolute blast! But I did things that I never would have done if it weren't for being put on the spot, on television, on Food Network. (Claire and I were willing to do anything to win!) Being the Amazing Race fan that I am, this was the perfect way for me to channel my inner competitor and take on the food scene in NYC like it was nobody's business. I have no doubt that this show will be a huge primetime hit. It is a privilege to be part of the series kickoff and I can't wait to watch the success of Chefs vs City unfold. 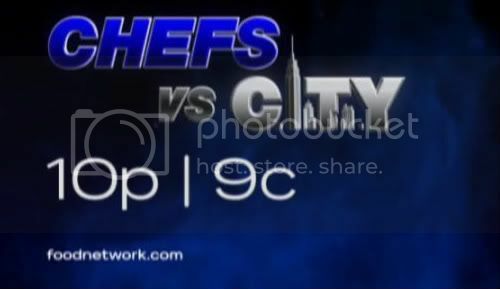 Chefs vs. City premieres TONIGHT at 10pm ET. Thanks Kelsey! I'll be watching... eventually. Have a great weekend everyone! I'll be back tomorrow, though, with a review of the first episode of Melissa d'Arabian's new show Ten Dollar Dinners. I love the chemistry between Aaron and Chris. I hope this is a taste of better things to come from FN and that it doesn't end up being "The Neely's Vs. City." Nice to see some class and interest coming back to FN. Interesting show. I especially liked the fact that we didn't hear one horrible squeal from any of them (Keep the Neelys away) even when they consumed that chili pepper. Great concept. Hopefully FN can keep it up. Great show, torture the contestants with food so hot it has no taste or need to be served to anyone. The concept is great, I hope to see more like it and less barbeque challenges, less chance for a neely appearance. Reminded me of one of the challenges on either Top Chef, TNIC or TNFNS. It was just fun to watch. Let's see what happens in Las Vegas next week. It was unwatchable. Why doesn't Food Network bring back Julia Child's original cooking shows?